Described as the ‘greatest literary show on Earth’, the ZEE Jaipur Literature Festival is the world’s largest free event of its kind. Equity and democracy run through the Festival’s veins, placing some of the world’s greatest minds, humanitarians, historians, politicians, business leaders. Every year, the Festival brings together a diverse mix of the world’s greatest writers, thinkers, humanitarians, politicians, business leaders, sports people and entertainers on one stage to champion the freedom to express and engage in thoughtful debate and dialogue. For Peter Bos it is for the first time that he has attended this festival: "The festival has a beautiful ambience and is well organized. Here comes everything together under the same roof: books, authors, artists. He doesn't have an expectation from the festival. "I just believe that it’s a nice place to network, meet the industry stalwarts exchanging contacts and ideas. Attending sessions and having a good time. Who knows, one might end up getting an opportunity to work them." 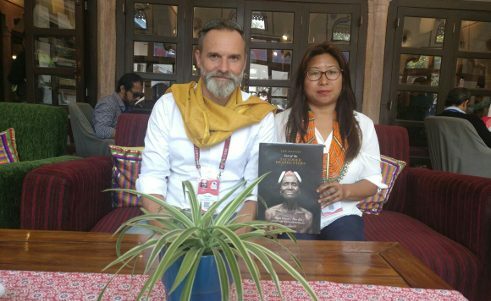 For his co-author Phejin Konyak Jaipur is a platform to meet writers and artists from all over the world, wherein one gets a chance to not only interact with like-minded people but also exchange ideas with them. Peter Bos und Phejin Konyak | © Aarushi Khanna A collaborative idea that was the source for a project they have done together: a book titled The Konyaks, Last of the Tattooed Headhunters. Phejin belongs to one of the tribes in Nagaland named Konyaks. The book is about the Konyaks tribe’s inhabitants. There were number of obstacles for both to collaborate, but in the end they form a great team - Phenjin an insider and Bos being the stranger to the tribe. "We both had different perspective and thus we have a very good combination." Their future plans sound exciting too. Phejin: "Our book is in English language. Firstly, we will translate our book in the native language and never say never - you might not know that our book is then translated in other European languages like Dutch, German, French. I understand that the language is an important instrument to a culture. Thus, we want our book to be translated in the native language of Konyaks, so that the story can be closer to the locals. Secondly, we have then planned to have one Children’s illustrated books." "it’s about exploring my cultural roots"
Reeta Loi is a writer, musician and working on number of projects at the moment. She has come to Jaipur to inspire herself and see Jaipur, as it’s a beautiful city as well. Reeta Loi | © Aarushi Khanna She sais: "It’s my first time in the festival. No, I belong to North- India, Punjab region and have been on a family visit. On this occasion, I will also visit Mumbai to attend the Queer pride parade. While some of my projects revolve around the LGBT activism for the south Asian communities. The festival is very diverse and it means a lot to me as I am from the Indian heritage. I write about life, in particular about the south Asian culture and Indian culture. And of course, it’s an opportunity for me to meet and attend the sessions of some of the writers I really admire. But it’s also to explore themes and topics around literature that are changing publishing communities as well as technology and social media has changed the way we write. For me it’s about exploring my cultural roots and no doubt that it’s one of the biggest international literature festivals of the world. And which topics is Reeta Loi focussing on? "I write poetry and short stories exploring themes of identity, gender, ethnicity, class, caste and sexuality." There is legal issues going on with regards to the LGBT. There is an old British ruling actually, that most of the common wealth countries have in play. In India, the rights manifester section 377 of the Indian penal courtthat penalizes sexual acts that would be deemed to be homosexual. There is no elements that doesn’t create room for people out in the media etc. and which then create surveillance for the communities. We deal with that in UK and is also seen in Germany and other European regions. We are camping globally to support the community in India for appeal of section 377, which looks like, that can be happening now as it’s in review currently. This is quite a huge shift and I am really excited!! 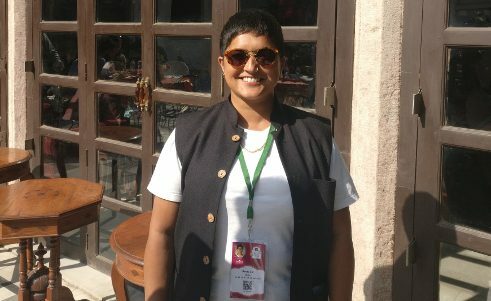 Working on the exchange program on the ‘Gaysiens’ communities, which is for South Asian desperate people and I am co-founder of Gaysians.org. We act as a link between the alliances with the LGBT charity groups in UK and outside. Through the exchange program I have learned that ‘as a queer person don’t feel safe coming back to your motherland, where it is still not legal. So we are developing such programs, where you feel that you have family and community." What brings you to JLF? Neeraj: My friend is a literature enthusiast and this brings me here. Akshita: I came here just for the curiosity of literature and interest for books. Madhav: I am here to attend various sessions and talk from renowned artists. Why do you think that the JLF is special? 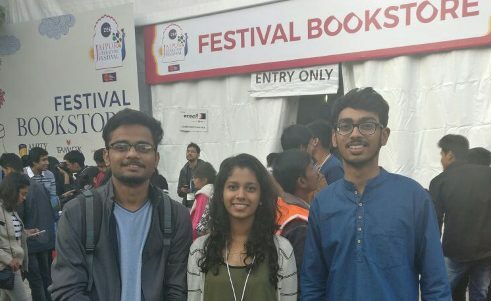 Students at JLF | © Aarushi Khanna Neeraj: It’s a 4-5 days festival, where not only one get a chance to meet and attend session by national artists, but also international. Various relevant topics and themes are discussed here and is great source of knowledge. It is one of a kind. Akshita: Like there is saying that being in the company of great people, make you feel good. It’s really special that people from different parts of the world, industries and genres are part of this festival. This is the most special part of the festival and attracts students me to attend the festival. Neeraj: Like strategic relation between India and Australia. Akshita: I have visited the session on women and power. That was focused on the present situation of women. How women are still held backward in area of politics. I am a feminist, so can say and look forward discussion on such topics. Madhav: I am fond of art forms and creative themes. I want to attend the session on various art forms -new upcoming art forms as well as old traditional art forms, which are now losing its essence and have been forgotten. Like the ‘Kalahari’, it’s a Rajasthan art form which is still practice in some villages, but the masses is not aware of it. 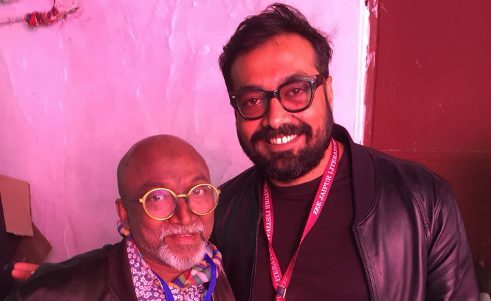 "I dont compare my work with Quentin Tarantino"
It is Anurag Kashyap´s first time at the lit festival. "There is so much to discover and I am still finding my way out. At this point, I can just say that right now there is lot of chaos. Amazing thing is the sessions and people you get to hear. I had my session and can say that the crowd is too much"
People call as Quentin Tarantino... "I like to do my own stuff. I don’t think so, but yes, I have heard about this a lot. I really don’t know how to react to it. Neither I compare my work with him nor am I influenced by his work." Anurag Kashyap | © Aarushi Khanna On a Literature festival it is no surprise to ask for films which would be good adaption for a book. Anurag anwers promtly: Gulal. It’s a movie about Rajasthan. Because there is so much in there, that was left unsaid. There is so much that I can do with it. It lends itself to a political intrigue and social –political intrigue. It also talks about space and time. But for the moment he is just finishing Sacred Games, which would be there on the Netflix. And yes, it would be available in Germany as well. And yeah, just to mention: "My favorite web series at the moment is the German Series ’Dark’. I just tweeted about it and finished last night. It’s outstanding and my favorite. Now, I am waiting for the next season."